This is a piece my husband wrote about his uncle, a man he never met but who will be forever young –- and remembered. Too many people have no idea what Memorial Day really is. It's become a day for barbecues, for beer, for picnics, for an extra day off work. But that wasn't the original intent. Memorial Day was meant to remember those who died preserving our freedom. Below is a tribute to one man who did. This is also for all the others who paid the ultimate price for our liberties. Can we remember? Or will we now let those freedoms wither in our brave new world? It must have been hell on earth – above earth to be exact. A booming, banging, grinding, shaking, shattering horror. Especially it must have been tough on him, hanging as he was below the belly of a crippled plane, a bubble of glass exposed to the flak and the fire from enemy aircraft. A tasty and too visible target. He was probably the youngest man on board. He was certainly the lowest-ranking member of the 10 men who made up the crew. That first day of August in 1943, he'd only been in the Army Air Corps for a year and a half. He'd only been overseas for six months. He was 19 years old. He came from a farming family that lived in a very small town in Kansas. He had one sister, two brothers and two very worried parents. He was assigned to 98BG, a bomber group stationed out of Benghazi, Libya. His mission that day? In coordination with 178 bombers and 1,700 crew members, the 98BG was to attack and destroy the oil refineries at Ploesti, Romania. These facilities provided the Third Reich with one-third of its fuel. And the Nazis were very hungry for fuel in the waning days of 1943. It was a tremendous undertaking. A gamble of men and machines desperately needed for the war effort. A 2,400-mile, 18-hour trip there and back again with only a half-hour of available time over the target. They say he's buried at a cemetery near Liege, Belgium. Maybe he is, maybe he isn't. 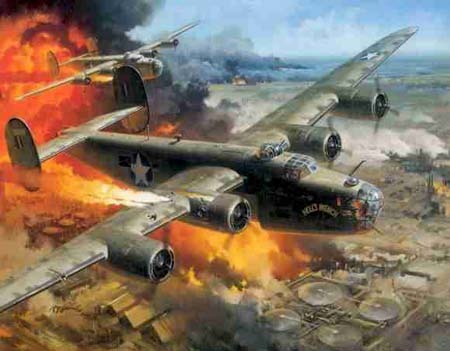 The records show that his B-24 was shot down over the refinery, but that it happened before the crew could disgorge the plane's 8,000-pound payload of high explosives. And the B-24 Liberator was well-known for burning merrily when it crashed. But I'm sure his name is on one of the white crosses standing in formation at the lovingly well-tended cemetery. His parents back in Kansas received the medals that he was awarded posthumously at a ceremony, probably one of many such ceremonies on that same day. 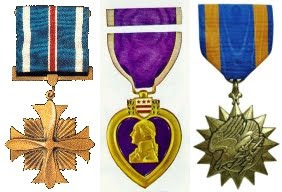 The medals were: a Distinguished Flying Cross, a Purple Heart and the Air Medal with three oak leaf clusters. The parents, the brothers and the sister passed away some time ago. There is now no one that can tell me anything more about Donald Phillip Sowers – sergeant, United States Army Air Corps. The uncle I never knew and whose name I share. Donald Philip Sowers never woke to the face of his bride on the day after his wedding. He never paced the floor late at night singing softly to an infant daughter who just couldn't sleep. He never got to hold his child's hand the last time she needed, or wanted, help to cross a street. He never felt the aches and pains of a long life, well lived. But I will remember him and so will my children. If you've taken the time to read this, tip a glass in his name and remember him – and all the other lost brothers and sisters as well. Donald Philip Sowers died fighting the greatest evil of our time. A young man of 19 who will never grow old. Have a happy, safe, and thoughtful Memorial Day. Our glass is raised today, as we have lost several family members as well. We give our thankful prayers to G-d for the sacrifices of all the brave lives, and especially to those who have been lost while defending to preserve the true works of liberty, freedom and righteousness. I was so deeply moved by this true story that I can't find the words to express myself. (No doubt a first for me!) So many of our young men and women have died protecting the citizens of our allies around the world, and yet today many of those ally's children and their children's children find nothing better to do than annoy, criticize, mock and insult us. Apparently memories are short, and the lessons they should have learned from experience and history are few or nonexistent. To the Quedulas of the world I say enjoy your arrogance and inconsideration for others. In a very short time you will be leaving this life. Maybe you're right. Maybe it's all a silly fantasy. If so, we believers will be unable to feel regret, and as they say in the sports world: "No harm, no foul!" But if the Word of God is true, what fools some mortals be. What a terrible chance you're taking to turn your back on God, His Son and the Holy Spirit! Wow, nicely expressed. Thank you. If your uncle were alive, he may not talk about it. I only say this as a reflection of my father's stint in Vietnam as a Marine. I remember asking him when I was a child about his time there. He didn't want to talk about it much. His eyes would turn to the floor as if images were flooding his memory. He simply said he lost a lot of friends there. He spent a Christmas in a fox hole. He showed me a little box with metals he'd won and shrapnel that was taken out of his knee. Thank you for reminding me of where our freedom's stem from. "love your enemies, do good to those who hate you, bless those who curse you, pray for those who mistreat you." and "If someone strikes you on one cheek, turn to him the other also (Luke 6:27–29)"
For all of those who served and didn't come home and for the families who had to endure a letter that began, "We regret to inform you" and ended with "From a grateful Nation"; thank you. What a vivid picture of what freedom really costs. To many people today just don't understand that the very freedom they enjoy came with a price. Today our pastor reminded us that those who have given the ultimate sacrifice so we can enjoy our pursuit of happiness should be appropriately remembered. I salute your uncle and I will remember that he died so I may enjoy my freedom. Thank you for sharing his story with us. I lift a glass of my best...and find it wanting. Thank you for sharing the story of a loved one. My uncle and my dad served in the WWII...My uncle in Patton' 5th and my dad on a troop transport. Freedom is never free...I thank any and all military past and present for the sacrifice they give by serving. Your Uncle Donald is buried at the Ardennes Cemetery in Belgium. My grandfather was one of the lead pilots at Ploesti--I was honored to attend the 60th Anniversary reunion. He was killed in action a few months after Ploesti Thank you so much for posting this!! Don, this made me cry. After I got composure, I read it to my hubby while he was doing some work on the other computer. He stopped and told me, very excited, that he grew up with a man who was in that very battle. He remembered one striking thing, this gentleman's hands shook uncontrollably. He said that it was a result of that battle. It was a difficulty that he lived with his entire life. I can't imagine the horror of that day. Thank you for sharing this story. We just can't say thank you enough to all of the families who have had to experience something similar for our precious freedoms. Shame on us if we ever take them for granted. I remember when I was a little girl my dad (WWII, Battle of the Bulge) tearing up during our annual community Memorial Day ceremony. I couldn't understand why; now I do. Thank you to all the servicemen and women, and thank you Don for posting this wonderful article. Thank you for making it real for those who may not understand. Today I raise my Glass in Honor of Sgt Mark Adams, who in giving his own life allowed others to come home. In honor of Donald and all of the others who will become "just another name on a headstone" please contnue to share Donalds story! Hi! We recently visited the Ardennes American Cemetery in Liege. I have pictures of your uncle's cross. I would like to send them to you, but I didn't want to send them without warning/permission since you don't know me at all! P.S. I sent an email to the advertising email address for Don on 16 SEP. Please forgive my impatience, but I'm SO excited to get these to you! Wonderfully written story about one of those we should never forget. He is remembered and now famous to many. Will you write an epitaph for me? Wow! Very well written, thank you.